Sweet blog friends, it’s time again for a delightful sneak peek at fabulous new Spellbinders Die Templates that are coming soon. This is one of my favorite times of the year because by playing with the templates, we really get to know them inside out and can tell you cool ways you can factor them into your collection. 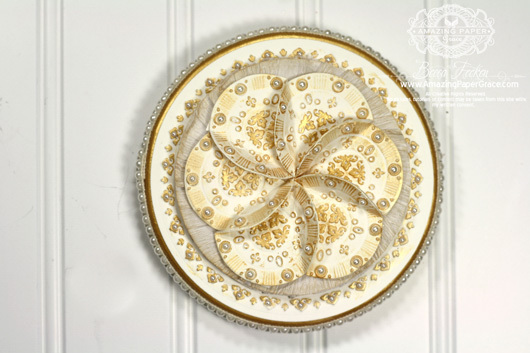 Because they are made in the shape of a circle, they are a natural to embellish any Spellbinders Circle shape and fit comfortably in between the nested circles. Remember though, they are not limited to circles, they’ll place raised decorative ring on anything you add them to like Spellbinders Marvelous Squares. While an embossing folder gives you an all over pattern, these elements will let you put motifs inside a shape. I started off with a gift project made to show off the ‘rings’ with this set. I created this round card gift set from a recycled ‘The Laughing Cow’ cheese box. 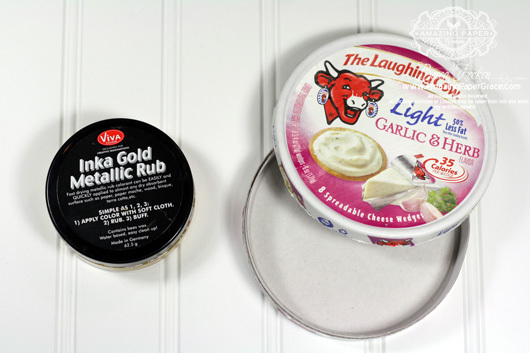 I glammed it up and then topped it with circles that are embossed and sparkle with an easy glimmer paste that I simply applied by rubbing my finger over the raised embossing. I have a step by step tutorial to show you how. 1. Peel the papers from the box. 2. 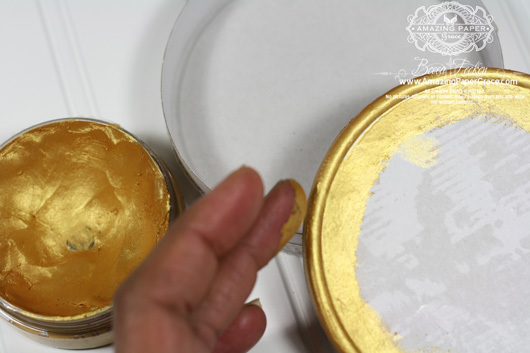 Using Viva Inka Gold Metallic Rub and touching lightly with one finger, rub the gold paste on all the areas of the box that will show. 3. 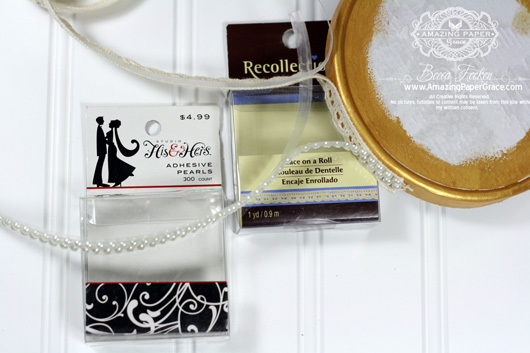 Go around the edges of the lid with adhesive lace and adhesive pearls. 4. Cut Spellbinders Grand Circles #1. 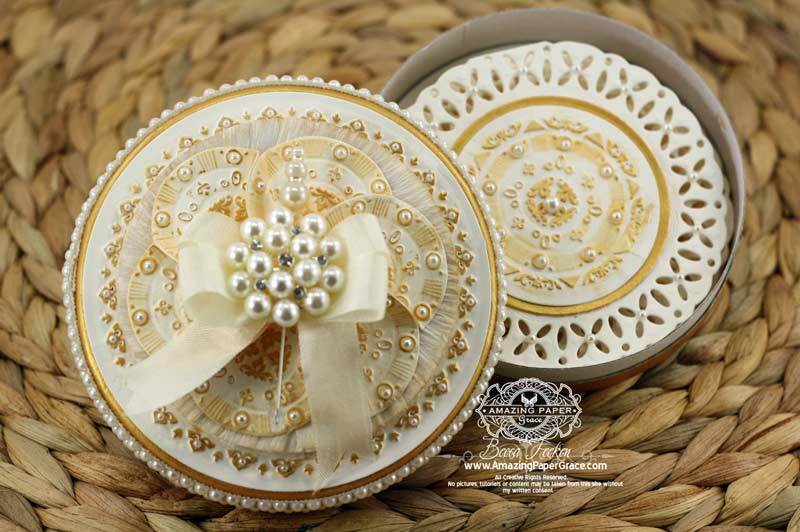 Emboss using Spellbinders S4-412 Gold Rounds One #8. 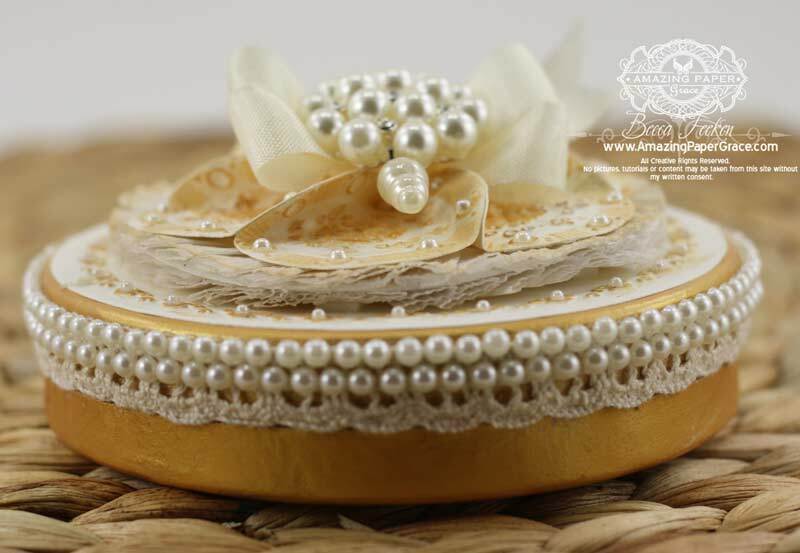 Burnish Inka Gold across embossed areas, add pearls then adhere to top of lid. 5. Take a length of crepe paper and gather into a circle inside perimeter of pearls. Trim any jagged edges before gluing to top of box. 6. 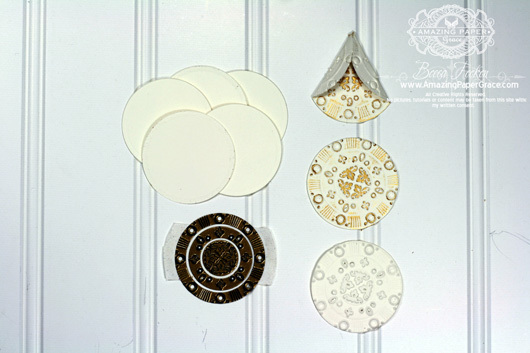 Cut six circles using Spellbinders Circles SM #3 and then emboss using Spellbinders S4-412 Gold Rounds One #1, #2, #3 at the same time. 7. Fold each embossed circle as shown and adhere flap to flap until all six circles are joined together. Adhere to top of box. 8. 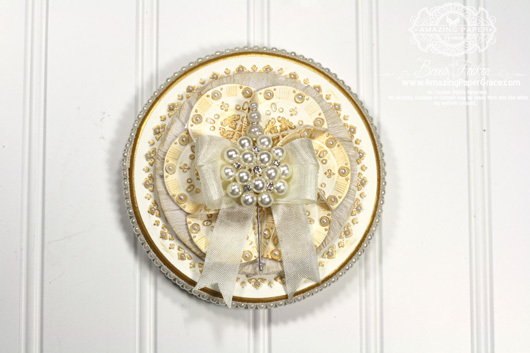 Embellish with pearls as shown, add a small bow and cluster of pearls. 9. Cut two Spellbinders Grand Circles #1. Adhere one circle shape to the bottom of the box. 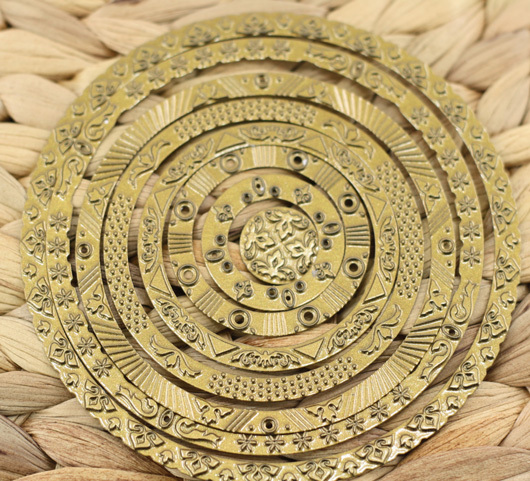 Emboss the other element using Spellbinders S4-412 Gold Rounds One #1, #2, #3, #4, #5, #6, #7 and #8 at the same time. 10. Adhere to the inside of the lid. 11. 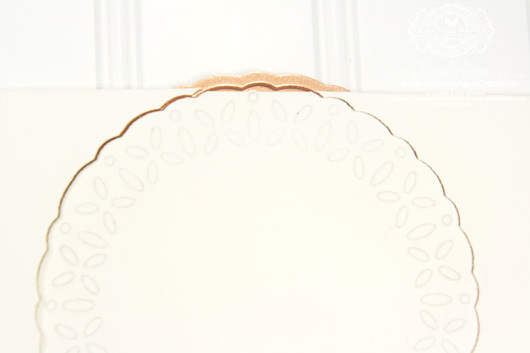 Cut/Emboss Spellbinders S4-415 Delightful Circles using a folded piece of cardstock positioned so that one edge of the paper falls short of the die cut line leaving the fold intact for a card base. 12. 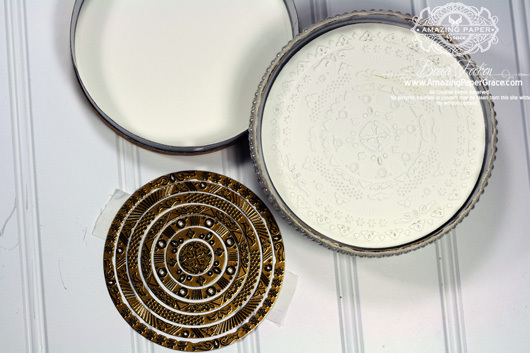 Cut/Emboss Spellbinders Standard Circles SM #5. Burnish rim of circle with gold paste. Adhere to center of card base. 13. 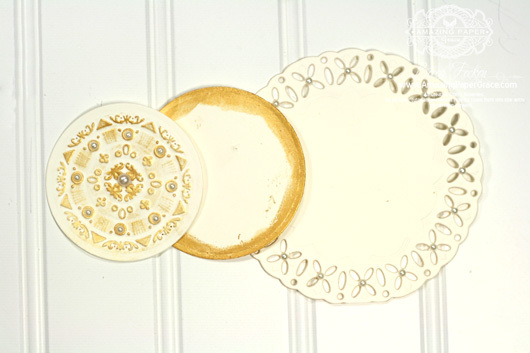 (As was done in Step 6 above) Cut Spellbinders Standard Circles LG #4 then emboss using Spellbinders S4-412 Gold Rounds One #1, #2, #3 and #4 at the same time. 14. 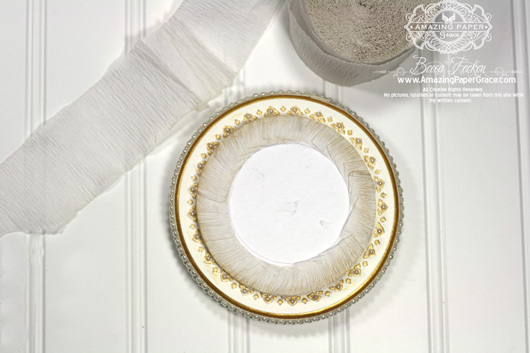 Lightly rub paste over the embossed areas, adhere to card base and embellish with pearls. 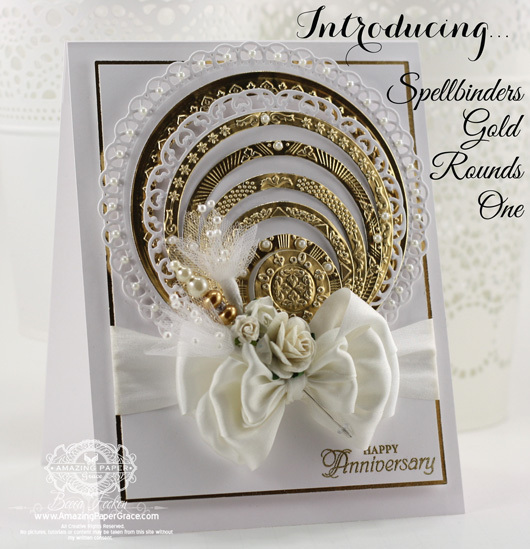 With such an elegant set of dies, what card making session would be complete without making an Anniversary Card? I just knew that these Gold Rounds One would look so elegant done in gold foil so show off their detail, and plays in so nicely with a special occasion. I used Spellbinders Standard Circles LG, Standard Circles SM and Grand Circles to cut out each tier of paper and foil – but it was much easier than you could imagine. I cut my foil with the entire set of Spellbinders Standard Circles SM together in one pass and embossed each with its matching Gold Rounds One set. My card size is 5-1/2″ x 7-1/4″. If you’re asking where to get the paper sized to make a large top folded card like this, you can see my tutorial on Spellbinders Hinged Cards to make the base. The best way to get started is to pick a card to copy, look at the die list and substitute similar core dies from your own collection, cut and assemble along with the instructions. You can do it! Click (Contest Has Ended) to Enter and WIN! Thank you so, so much for stopping by. Be sure you enter the contest above in the next 48 hours and would love it if you would leave a comment here on the blog – just lets us know what you think!! That was my chin hitting the desk! Becca, does your creativity know no bounds?? Your designs are beyond stunning! Beautiful! Love this project it was so different. WAUW WAUW WAUW and then doubble WAUW. You just did it again here Becca, and overdid yourself once more. I really don´t get it, how you do this over and over again, but you do. This is sooooooo beyond amazing, and gorgeous and fantastic and fabulous and what more words can I think of. Absolutely stunning work as always hun. This is beautiful, love the tutorial! I love the card, it is stunning! I always enjoy your sampleings of the new dies Becca. I am totally in love with the gorgeous card!!!!!!!! It is so elegant. Your ideas always amaze me. These dies are going to be so fun to create with and are so versatile. Must haves for sure. Oh My Goodness, Becca. How very beautiful are these creations! Just LOVE them. Thank you so much for sharing. a work of art by my Favorite Artist: Becca! Thank you for your Gift to all of us today…I needed it ! Absolutely gorgeous what can be achieved with these new items that would go really well with my card collection. Thank you Becca for the tutorial. Becca your cards are amazing. This set is gorgeous! What you have done with the gold rub on paste and the gold paper is AWESOME! Becca you floor me , how do you keep coming up with the most amazing designs, But then with these fantastic spellbinder dies its so easy to see how you can do things. Love that gold it is so rich on the card. wow looking forward to seeing what else you have done. But for some reason cannot see what other designers there are. Becca you make all the Spellbinders dies shine to thier fullest. Beautiful project as always Becca. Wow! Wow! WOW!~ This is gorgeous! Now I have to add some metal paste to my must have list! Thanks! OK< so this is the place that I need to comment on today – not yesterday's post even if it was today…………. Anyway, thanks once again for such beautiful inspirations. That you create and share is a blessing to all of us! Hi Becca this new Die is stunning and your card is fantastic. This die is a must have. I love the gift box also the card. Becca, your projects are both breathtaking! 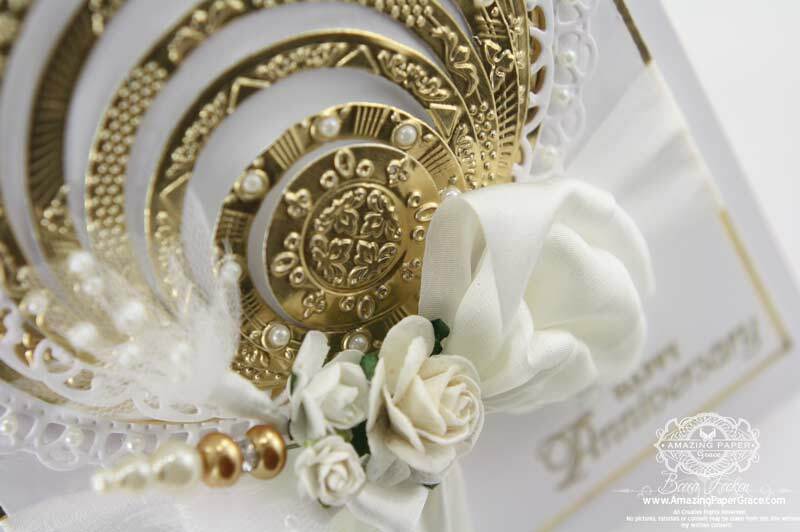 I love how you folded the die cuts to give added dimension, and the gold rings on the second card are stunning! I am just in love with your work! Becca, you never cease to amaze me!!! Absolute gorgeousness! I am in love Becca You have made such a stunning card and gift box I just have to make this card no and if or buts here I must make this!!!! I just fall in love with what you do with these dies and I love everything you grace us with. You are such a blessing to all of us. This is gorgeous, as usual. Your talent is such a blessing. Once again Becca, your work is just stunning! Love the new use for the cheese box–I am always saving containers to reuse–make my husband crazy, yet he never believes me when I actually DO reuse them! 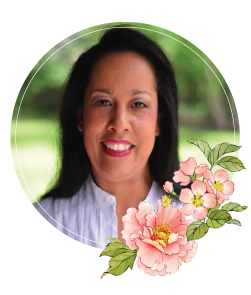 You have stimulated my Spellbinders addiction–which also makes my husband crazy!! Poor man has MANY mental issues! Wow wow wow – Your projects are so wonderful – congratulations – love them and all spellbinder dies. Wow! Where was this when I was “constructing” my husband’s 50th anniversary card? Naturally I selected “your” A-2 Filigree die and it came out really good but this one is also very elegant. It is definitely a must have and will be ordering it real soon. Becca, this is one of the most beautiful projects I think I’ve seen! Seriously! I cannot wait to order these dies and play with them. In fact, your post today is so awesome I’m sharing it on my personal FB page for all my non-stamping friends to see what they’re missing *giggle* I’ve also added this to my Pinterest board. Be still my heart!! 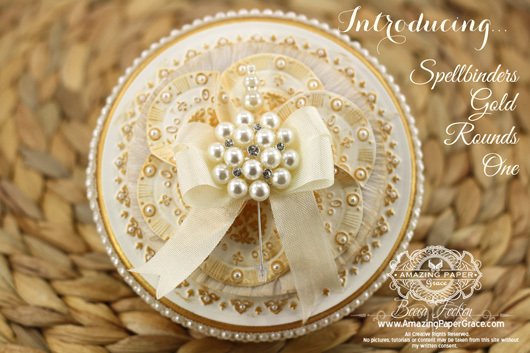 Hi Becca, These gold round dies are stunning, I absolutely love what you did with the box, and the card is stunning. 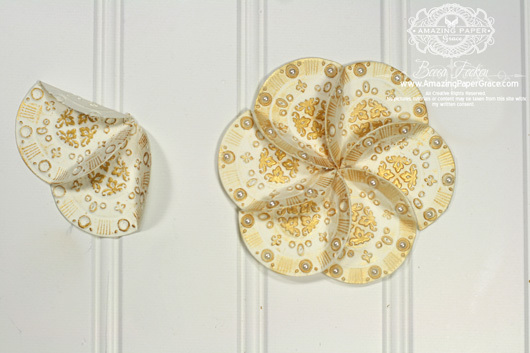 These dies are a definite ‘must have’ set, I would love to have these in my crafty goodies. Just amazing. Such a beautiful set. Wow! Love the colour scheme and the sensational project!